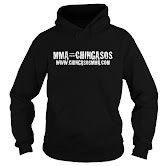 Women, MMA and Chingasos | MMA Fighting Events Videos Techniques UFC Fight Picks and News. I've said it before and I'll say it again, women in MMA tend to have some of the best fights. Unfortunately, they're not showcased as much as the men. As a matter of fact, the UFC doesn't even have a women's division. That might change in the future, but for now, if you want to see women MMA fighters you're going to have to watch them somewhere other than the UFC. For an excellent example of what an entertaining show women MMA fighters can put on, check out the fight video of Gina "Conviction" Carano vs Cristiane "Cyborg" Santos. Gina was coming into the fight undefeated at 7-0. Cyborg only had one loss on her record which was in her MMA debut and was coming into the fight on a seven fight winning streak. Strikeforce did a great job putting this fight together and I hope they can set up a rematch soon. I'd love to see these two fighters exchange more chingasos!